The Cal Salmon River is popular for both private and commercial boaters. While there aren’t a whole load of logistics to take care of, the river is definitely a technical, challenging stretch of whitewater and unless you are an experienced Class IV+ boater, you should go with an outfitter. Plus, some of the rafting companies provide riverside hot tubs and gourmet meals. There’s really no better way to end a day of thrilling whitewater rafting than with a glass of wine, a delicious hot meal, and a jacuzzi. Permits aren’t needed to run the Cal Salmon, so as long as the flows are good, you can go any time of year, any day of the week, any hour of the day. Most multi-day trips on the Cal Salmon involve running different sections each day and camping at a main, riverside campground. The beautiful thing about campgrounds on the Cal Salmon is that you are so far “out there” that they still feel like you’re in the middle of the wilderness (and truthfully, you are), but you don’t have to lug all your camping gear, food, and beer downstream with you. Make sure to check road conditions and and do not just rely solely on a GPS device or a map website. Many of the road in the Cal Salmon area are Forest Service maintained and aren’t open in the winter. Don’t find this out the hard way. Check before you go! Most of the Nordheimer and Butler sections are roadside, so the Cal Salmon River shuttle is easy once you actually get to the river. It’s the getting there part that can be long and complicated, depending on what time of year you go. In the winter, some of the roads are closed due to snow, so make sure you check the california road conditions before you start driving. GPS devices don’t typically tell you if a road is closed for the winter and several parties of boaters have learned that lesson the hard way. Put-in for Nordheimer Run: Nordheimer Campground There are several ways to get to Nordheimer, depending on what your start point is. If you are coming from North of Redding or from the Arcata area, directions will differ from ours. From Redding, take Hwy. 299 West through Weaverville and toward Willow Creek. Turn right onto Hwy. 96 north to Orleans. 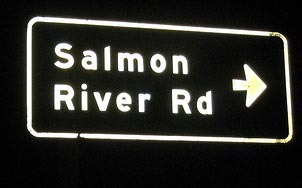 Drive 8 miles past Orleans and after you cross the Salmon River, take a right onto Salmon River Road. This road is not marked but there’s a sign that says “Forks of the Salmon”. You will be on Salmon River Rod for about 13.5 miles. Nordheimer Campground will be on your left. If you happen to get to Forks of the Salmon, turn around because you’ve gone about 4 miles too far. Take-out for Nordheimer (Put-in for Butler): Just Upstream from Butler Creek There are several options for taking out, and you can always continue on to run the Butler section, but the most popular take-out is Butler Creek. On Salmon River Road, Butler Creek is about 6.5 miles downstream from Nordheimer Campground. Parking is plentiful. Take-out for Butler: Oak Bottom Campground The main take-out for Butler is Oak Bottom Campground, about 5 miles downstream from Nordheimer, but you can really take out just about anywhere. Some people even choose to raft all the way to the Klamath River and then to the Pacific Ocean!